^ a b c d e f g h i j k l "Nobuo Uematsu Profile". Game Music Online. Archived from the original on September 24, 2014. Retrieved August 18, 2014. ^ Dammann, Guy. "Nobuo Uematsu: the video game composer shaking up classical music". The Guardian. London. Archived from the original on April 11, 2016. Retrieved April 10, 2016. ^ a b "Classic FM Hall of Fame (retrieved 6 April 2013)". Classic FM's Hall of Fame. Archived from the original on October 13, 2014. Retrieved October 8, 2014. ^ a b c d e f g h i j k Mielke, James (February 15, 2008). "A Day in the Life of Final Fantasy's Nobuo Uematsu". 1UP.com. Archived from the original on February 7, 2013. Retrieved May 30, 2008. ^ Jeremy Dunham (March 9, 2005). "Dear Friends: Final Fantasy in San Francisco". IGN. Archived from the original on December 15, 2010. Retrieved July 16, 2010. ^ "N's profile". Square Enix USA. Archived from the original on May 17, 2008. Retrieved June 1, 2008. ^ squaresoundcom (October 15, 2008). "Nobuo Uematsu and Arnie Roth – Live Interview (Part I of II)". YouTube. Archived from the original on July 18, 2011. Retrieved July 8, 2009. ^ Fear, Ed (December 13, 2007). "Sakaguchi discusses the development of Final Fantasy". Develop. Intent Media. Archived from the original on August 5, 2011. Retrieved October 16, 2008. ^ Kohler, Chris (2005). Power-Up: How Japanese Video Games Gave the World an Extra Life. BradyGames. ISBN 0-7440-0424-1. ^ "Final Fantasy Tactics Advance Tech Info". GameSpot. Retrieved August 27, 2009. ^ VanBurkleo, Meagan (May 27, 2009). "Nobuo Uematsu: The Man Behind The Music". Game Informer. Archived from the original on June 1, 2009. Retrieved June 16, 2009. ^ Niizumi, Hirohiko; Kohler, Chris (November 1, 2004). "Nobuo Uematsu leaving Square Enix". GameSpot. Archived from the original on May 25, 2011. Retrieved June 1, 2008. ^ "The Black Mages III Interview with Nobuo Uematsu". Music4Games. March 18, 2008. Archived from the original on June 24, 2008. Retrieved June 11, 2008. ^ "Exclusive Interview Feature: Interview #2: Nobuo Uematsu, Smileplease". RPGFan. April 1, 2004. Archived from the original on March 3, 2012. Retrieved February 2, 2012. ^ "Gameography". nobuouematsu.com. Archived from the original on March 25, 2009. Retrieved July 7, 2009. ^ Tanaka, John (December 24, 2008). "Cry-On Canned". IGN. Archived from the original on December 28, 2008. Retrieved December 29, 2008. ^ Schneider, Peer (May 10, 2006). "E3 2006: Uematsu Scores Smash Bros". IGN. Archived from the original on December 11, 2007. Retrieved June 1, 2008. ^ "Staff" (in Japanese). guinsaga.net. Archived from the original on March 14, 2009. Retrieved October 7, 2008. ^ "Final Fantasy composer talks to us about upcoming e-book". Archived from the original on October 14, 2014. Retrieved October 8, 2014. ^ "Classic FM Hall of Fame (retrieved 9 April 2012)". Archived from the original on October 28, 2014. Retrieved October 8, 2014. ^ "Hall of Fame – Classic FM". Classic FM's Hall of Fame. Archived from the original on October 13, 2014. Retrieved October 8, 2014. ^ "Classic FM Hall of Fame 2015". Archived from the original on April 10, 2015. Retrieved April 19, 2015. ^ Davis, Elizabeth (March 28, 2016). "The Lark Ascending reaches the top of the Classic FM Hall of Fame for the third year in a row". Classic FM. Archived from the original on March 31, 2016. Retrieved March 28, 2016. ^ O'Brien, Lucy (September 19, 2018). "Final Fantasy Composer Nobuo Uematsu Stopping Work Due to Health Problems". IGN. Retrieved September 20, 2018. ^ Phillips, Tom (September 20, 2018). "Legendary Final Fantasy composer Nobuo Uematsu ceases work due to illness". Eurogamer. Retrieved September 20, 2018. ^ "Behind the Games: Meet the Composers – Nobuo Uematsu". GameSpot. July 31, 2009. Archived from the original on August 3, 2010. Retrieved August 28, 2009. ^ squaresoundcom (October 15, 2008). "Nobuo Uematsu and Arnie Roth – Live Interview (Part II of II)". YouTube. Archived from the original on September 14, 2013. Retrieved July 5, 2009. ^ "The Concerts". VGMConcerts.com. Archived from the original on February 20, 2007. Retrieved June 6, 2008. ^ "The Concert Programs". VGMConcerts.com. Archived from the original on April 10, 2008. Retrieved June 6, 2008. ^ "Seiji Honda performs Final Fantasy music". VGMConcerts.com. Archived from the original on February 22, 2009. Retrieved June 1, 2009. ^ "Nobuo Uematsu to attend GC-concert". VGMConcerts.com. July 15, 2006. Archived from the original on December 21, 2008. Retrieved June 6, 2008. ^ "Opera singer Izumi Masuda to perform at GC concert". VGMConcerts.com. March 27, 2007. Archived from the original on December 21, 2008. Retrieved June 6, 2008. ^ Schneider, Peer (May 11, 2004). "Dear Friends: Music From Final Fantasy". IGN. Archived from the original on March 22, 2007. Retrieved June 5, 2008. ^ "Final Fantasy In Chicago". IGN. December 14, 2004. Archived from the original on February 16, 2008. Retrieved June 5, 2008. ^ "Final Fantasy – More Friends, More Music". IGN. April 28, 2005. Archived from the original on March 28, 2008. Retrieved June 5, 2008. ^ "Welcome your Eminence". The Age. November 20, 2004. Archived from the original on April 3, 2005. Retrieved November 20, 2004. ^ GameSpot Staff (June 6, 2006). "Final Fantasy concert DVD coming to Japan". GameSpot. Archived from the original on October 25, 2012. Retrieved June 11, 2008. ^ "Nobuo Uematsu to attend Chicago world-premiere". Play! A Video Game Symphony. April 8, 2006. Archived from the original on May 19, 2009. Retrieved June 5, 2008. ^ "Nobuo Uematsu composing for PLAY!". Play! A Video Game Symphony. February 23, 2006. Archived from the original on October 14, 2007. Retrieved June 5, 2008. ^ "Nobuo Uematsu to attend Stockholm concert". Play! A Video Game Symphony. March 24, 2006. Archived from the original on October 13, 2007. Retrieved June 5, 2008. ^ "Nobuo Uematsu to attend Toronto concert". Play! A Video Game Symphony. July 11, 2006. Archived from the original on March 3, 2007. Retrieved June 5, 2008. ^ "Distant Worlds to premiere in Stockholm". Distant Worlds: Music from Final Fantasy. October 15, 2007. Archived from the original on May 3, 2008. Retrieved June 4, 2008. ^ "Distant Worlds is coming to Chicago". Distant Worlds: Music from Final Fantasy. October 18, 2007. Archived from the original on May 1, 2008. Retrieved June 4, 2008. ^ "MAGFest runs on video game music". December 20, 2011. Archived from the original on July 12, 2012. Retrieved November 18, 2012. ^ "From Mega Man To Final Fantasy, Live Video Game Music". January 18, 2012. Archived from the original on October 14, 2012. Retrieved November 18, 2012. ^ "Distant Worlds: Adelaide South Australia|". Archived from the original on July 12, 2012. Retrieved November 25, 2012. ^ "Lost Odyssey Review". GameTrailers. Archived from the original on May 5, 2012. Retrieved June 11, 2008. ^ Spence D.; Schneider, Peer; Dunham, Jeremy (July 9, 2004). "Nobuo Uematsu Interview". IGN. Archived from the original on March 14, 2008. Retrieved June 11, 2008. ^ "Twelve Days of Final Fantasy XII: Nobuo Uematsu Interview". IGN. October 23, 2006. Archived from the original on December 7, 2006. Retrieved June 5, 2008. ^ Hamamoto, Ben (September 8, 2009). "Nobuo Uematsu: An Interview with Video Game Music's Premier Composer". Nichi Bei Times. Archived from the original on September 30, 2011. Retrieved September 12, 2009. ^ Farley, Christopher John (May 19, 2001). "In Fantasy's Loop". Time. Archived from the original on December 31, 2008. Retrieved June 10, 2008. ^ Huang, Michael. "Biography". nobuouematsu.com. Archived from the original on July 24, 2008. Retrieved June 4, 2008. ^ a b "Nobuo Uematsu". Square Enix. Archived from the original on June 1, 2012. Retrieved July 6, 2011. ^ a b Olin, John. "Interview by Xbox Evolved". Xbox Evolved. nobuouematsu.com. Archived from the original on August 21, 2008. Retrieved June 11, 2008. ^ "Interview by Bob Rork". nobuouematsu.com. Archived from the original on August 21, 2008. Retrieved May 30, 2008. ^ Ashmore, Patrick. "One Winged Angel Translation and Background". RPGamer. Archived from the original on September 28, 2012. Retrieved July 8, 2009. ^ Suds (2004). "Video Game Music In the Olympics!". Video Game Music Archive. Archived from the original on May 13, 2008. Retrieved August 29, 2006. ^ "The Culture of Videogame Music". Empire arcadiA. 2005. Archived from the original on October 27, 2006. Retrieved August 29, 2006. ^ "Japan Gold Disc Award 2000". Riaj.or.jp. January 21, 1998. Archived from the original on February 8, 2012. Retrieved February 2, 2012. ^ "The Music of Distant Worlds: interview with Nobuo Uematsu and Arnie Roth". Asia Pacific Arts. August 27, 2010. Archived from the original on April 11, 2012. ^ Square Enix North America Site Staff (2005). "Uematsu's Music". Square Enix North America. Archived from the original on March 12, 2009. Retrieved May 2, 2006. 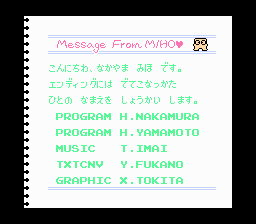 ^ "Message from MIHO♥" (PNG). Archived from the original on November 8, 2014. ^ Spencer (May 8, 2013). "Nobuo Uematsu Composed A Song For Ragnarok Odyssey Ace". Siliconera. Archived from the original on April 19, 2014. Retrieved April 10, 2014. ^ "Nobuo Uematsu and Kenji Ito join Oceanhorn!". July 15, 2013. Archived from the original on November 4, 2013. Retrieved July 19, 2013. ^ "Hironobu Sakaguchi announces Terra Battle for smartphones". July 1, 2014. Archived from the original on July 6, 2014. Retrieved July 1, 2014. ^ "FINAL FANTASY LEGENDS YOSHITAKA AMANO AND NOBUO UEMATSU CONTRIBUTING TO TURBO'S DEBUT GAME, SUPER SENSO". Gamasutra. Archived from the original on March 10, 2016. Retrieved February 27, 2016. ^ Cooper, Sammy. "Terra Battle 2 Announced, First Trailer Revealed". Twinfinite. Archived from the original on June 23, 2017. Retrieved June 29, 2017. ^ "Defender's Quest II: Uematsu Music, Battle Art, Story!". Fortress of Doors. Archived from the original on October 14, 2015. Retrieved October 13, 2015. ^ Sato (May 14, 2018). "Nobuo Uematsu Confirmed To Be Working On Music For Final Fantasy VII Remake". Siliconera. Curse, Inc. Archived from the original on May 14, 2018. Retrieved May 14, 2018. ^ "Project Phoenix Japan's indie RPG feat. AAA talent! – Kickstarter". August 12, 2013. Archived from the original on August 14, 2013. Retrieved August 12, 2013. ^ "Aya Hirano to Sing Fairy Tail Film's Ending Theme". May 30, 2012. Archived from the original on March 7, 2014. Retrieved June 23, 2013. Wikimedia Commons has media related to Nobuo Uematsu.